Helen Simpson, from the Mushroom Shed, interviews Guy and Susan Palmer, from Eltham. 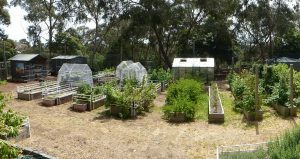 Guy plays a leadership role at Incredible Edible Eltham, is one of the organisers of Eltham Farmers’ Market, writes the weekly Local Food Connect newsletter, provides advice to Sustainable Gardening Australia, and maintains this website. For my last interview before going back to University, I have chosen Guy and Susan Palmer, well known through Local Food Connect (LFC), the Eltham Farmers’ Market and numerous other local activities. Susan greets me with a cheery welcome as I arrive at the front gate and walk through to Guy and Susan’s well-designed, splendidly looked-after and large Eltham garden. 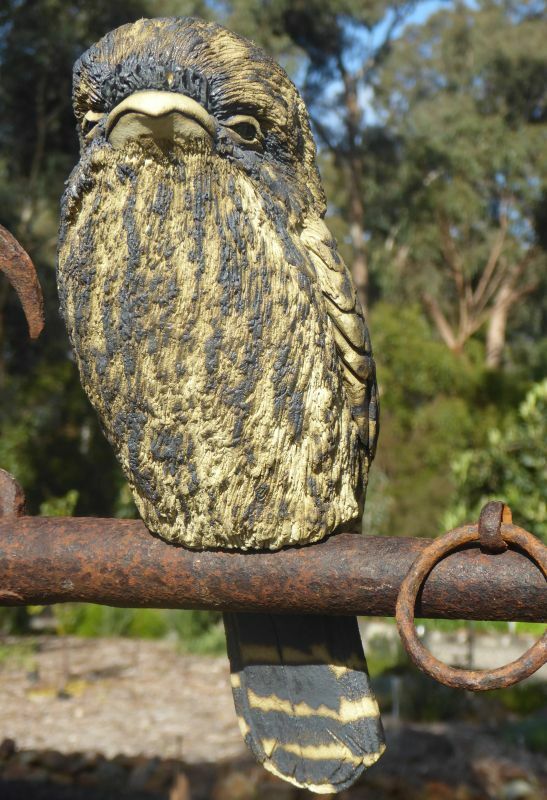 There’s plenty to admire on our way to the front door – meandering gravel paths with dry stone edges, wonderful garden art, well-kept native plants and an extensive ‘orchard’ of well-pruned fruit trees basking in the sun. Susan lays out fresh chunky biscuits and delicious vanilla slices bought from the Eltham Farmers’ Market that day so we can enjoy morning tea together whilst we talk. Guy and Susan originally met in the UK many years ago – both have an IT background. In 2007, Susan felt the desire to return to Australia, where she grew up, so they moved to Melbourne – living at first on the standard quarter acre block in the eastern suburbs. They developed a small scale veggie garden on this block; however, as time went on, both desired a larger garden and swapped their increasingly sought-after ‘school zone’ block for the beauty of a larger Eltham acreage. When young, neither Guy nor Susan grew up with veggie gardening being prominent in their lives; however, in adulthood, Susan increasingly felt the desire to follow sustainability practices and leave the world in a good place. Guy wanted to share a common hobby with Susan so, once in Eltham, their unused tennis court provided a wonderful flat space on which to develop an extensive veggie garden. Today the tennis court space supports fifteen raised beds, devoted to veggies, berries and vines. 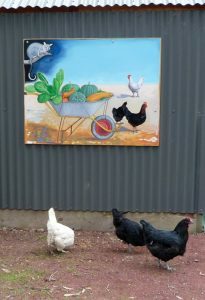 Guy and Susan called upon a number of people to assist in building their chicken coop and raised veggie beds, including Greg Parsons from Yummy Gardens (St Andrews) and Mac McVeigh (Eltham), who writes from ‘Mac’s tips’ in the Local Food Connect newsletter. 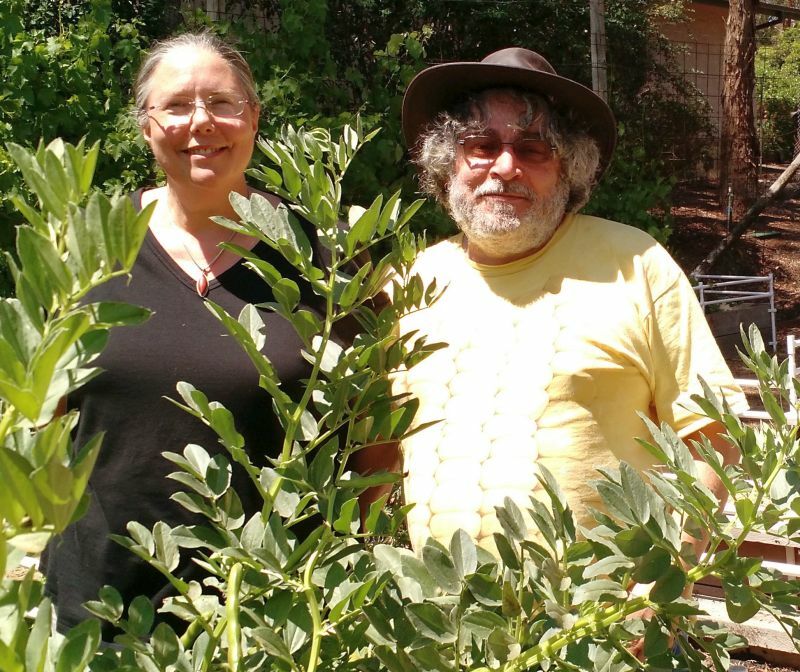 Methodical in their approach, Guy and Susan drew up a list of what they wanted to grow, mapped out a growing calendar and, via the Internet, researched how to grow their requirements. Firstly hit and miss, successes started to come with Guy doggedly persistent that they should keep growing a particular vegetable until successful. Brussels sprouts remain an unconquered challenge! Today their veggie beds are a thriving mass of veggies and berries. Together with the fruit grown around their garden, they are mostly self-sufficient and eat a wider range of veggies as a result of their growing. Generally they only buy in other fruit and vegetables if Susan needs them for a recipe. They produce more than they can eat and give an amount away, plus feed excess to their chickens. 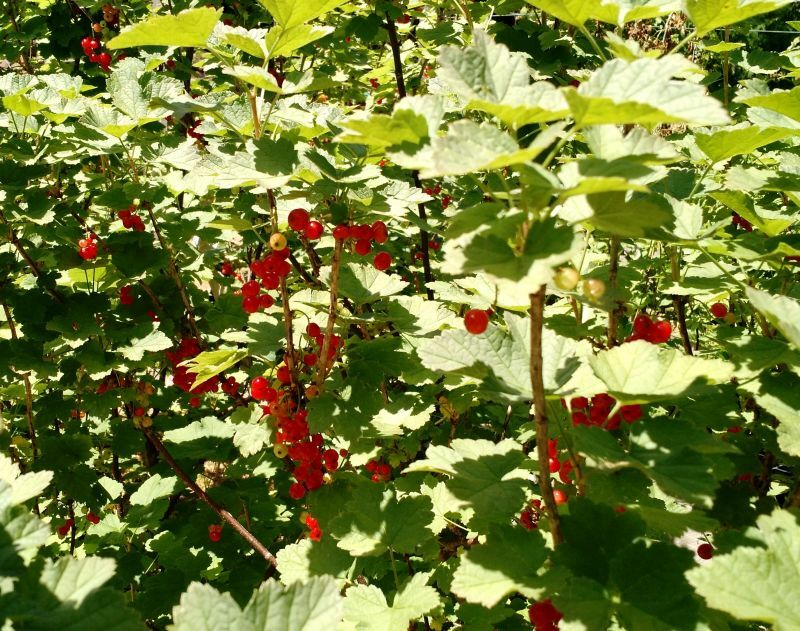 In addition, they preserve, make jams, relishes and dehydrate their produce. Guy enjoys the science of growing and has developed a crop rotation process with ten of the veggie beds. 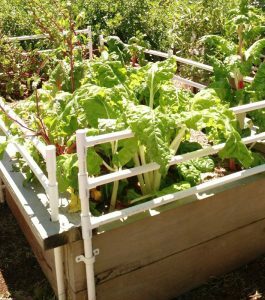 The beds are divided into two sets of five – these being two beds each of (i) legumes, (ii) cucurbits, (ii) root vegetables, (iv) solanums and (v) brassicas – which are systematically rotated, with heavy and light feeders alternating. After the heavy feeders finish their season, compost and fertiliser is re-added to revitalise the soil. The only products used on their fruit and veggies are certified for organic input. The remaining beds support perennials such as asparagus, globe artichokes, rhubarb, berries and vines. They have even tried peanuts, with some success, although the amount of produce varies enormously by plant. The raised beds keep out the rabbits, chickens and dog. 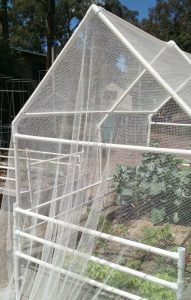 The netting keeps out the cabbage moth as well as birds. Guy and Susan also have a ‘no kill’ policy, which extends to slugs and snails. For fun, their seed planting schedule is based on moon phase planting. The crop rotation (which means that the veggies move around) limits their use of companion planting. 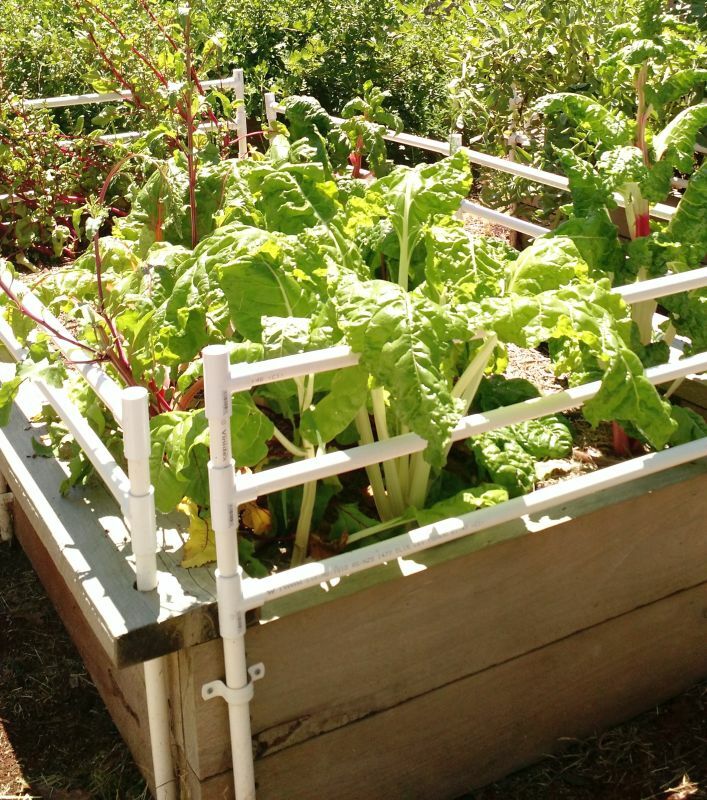 Water tanks support the veggie garden with a drip irrigation system being used. Guy and Susan also have solar power, with battery storage and with numerous solar panels located on their garage roof. A greenhouse supports young seedlings, with Guy and Susan regularly employing KABUU’s (aka Richard Lee’s) soil blocking machines to germinate and raise seedlings. 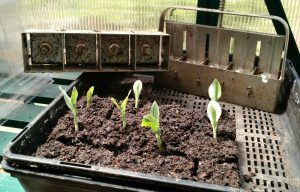 Corn seedlings are currently growing strongly using this method. The list of what Susan and Guy grow is extensive, so it’s no wonder they are almost self-sufficient. Apart from their veggie beds, they have added to the fruit trees left by the previous owners, and the list now includes apples & pears, plums, cherries, apricots, peaches & nectarines, citrus trees, pomegranates, loquats, olives, guava, grapes, passionfruit, kiwifruit (grown on the tennis court fence), as well as more unusual trees such as avocados, walnuts, bananas, cherimoyas and jabuticabas. 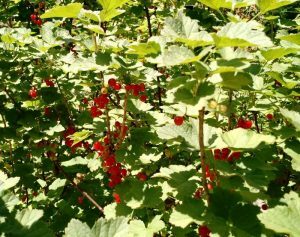 They’ve had no produce from the exotic fruits yet, as they provide more of a growing challenge in both Winter and Summer. 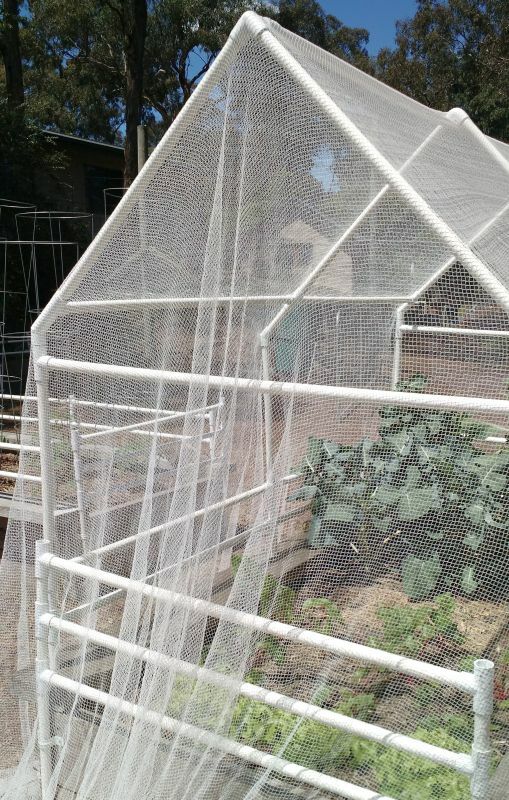 Shadecloth and netting cover the fruit trees when necessary, with a piping structure providing the frame for ‘easy on, easy off’. Many of their trees are dwarf trees to enable them to fit more in. Other unusual plants include amaranth and bush food such as Tassie peppers – Susan offers me a leaf to taste which is very peppery and apparently the berries are even more so. 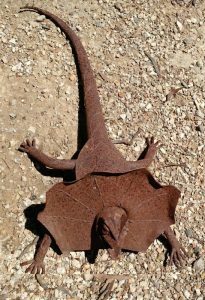 Whilst Guy and Susan retired from their day jobs some years ago, this hasn’t stopped the pace of their day. They are very involved with Local Food Connect and the Eltham Farmers’ Market and Guy’s efforts with the website and newsletter are appreciated by many readers. They visit many community gardens and both find it enjoyable to talk to other gardeners and food producers and swap knowledge. Guy is also involved in Sustainable Gardening Australia – looking after their website as well as providing technical support. He is also President of Nillumbik’s University of the Third Age (U3A) and teaches courses ranging from the history of modern art and quantum mechanics. 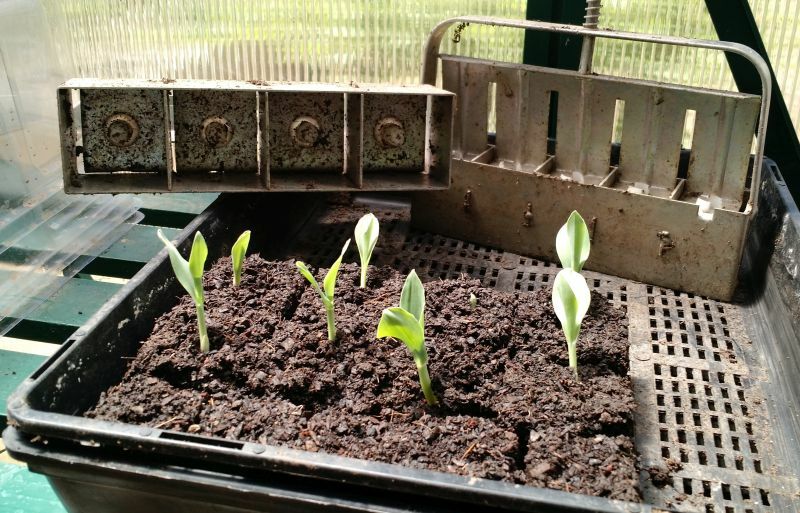 One of Guy’s current projects is ‘Incredible Edible Eltham’ (you can join the Facebook Group), where the concept is to develop local food availability – Eltham Railway Station now has a food garden. Opened recently by Vicki Ward, MP for Eltham and Peter Clarke, Mayor of Nillumbik Shire Council, it’s hoped that this food garden will raise the visibility of food growing, particularly amongst children. Susan’s other interests extend to complementary therapies, including massage, aromatherapy and Reiki, with Susan having undertaken several courses in these fields. The herbs grown in their garden assist Susan with aromatherapy. She is also interested in mosaics and stained glass and there is some of her beautiful and elegant artwork around their house. As I leave, Susan hands me some of her tomato relish – made with their homegrown tomatoes and garlic (delicious! ), so I get to take home some of their lovely garden in a jar to enjoy. It’s been a treat to see the home and garden behind two people that many LFC readers know well, and appreciate the energy and time that has gone into creating it. Very inspirational. And I’ve been to Guy’s and Susan’s veggie garden and fruit trees. 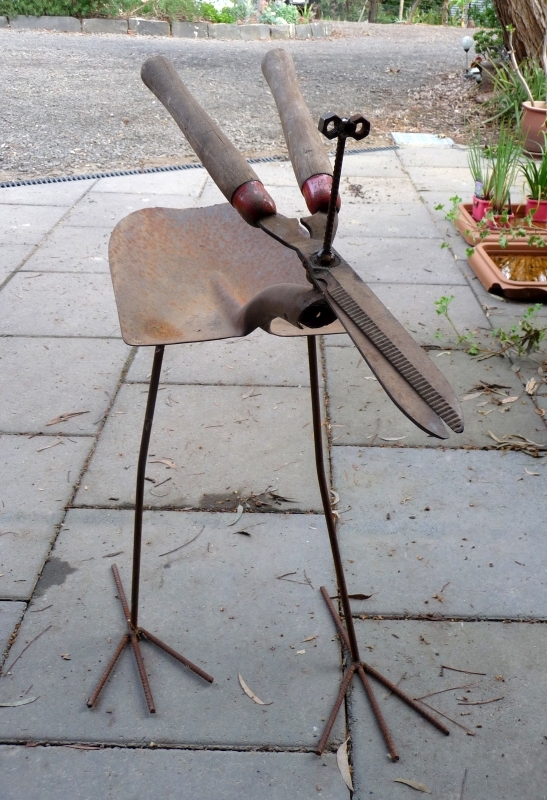 Always a joy to see and I also like the sculptural features in the garden. 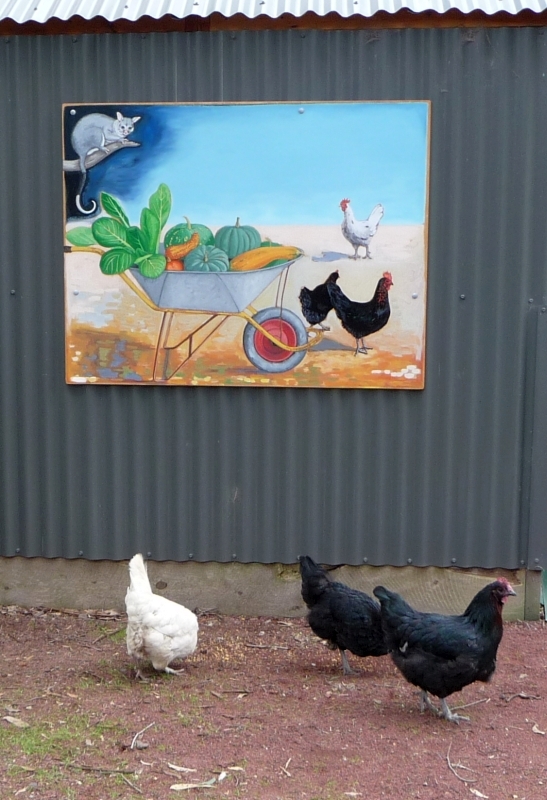 I’ve taken note of the crop rotation and the digging-in of composting and organic fertilising after a crop is finished. One question for Guy: I’m pondering over how best to manage the soil in long-term wicking beds? I’ve noticed that, over the years, the soil does shrink down somewhat. 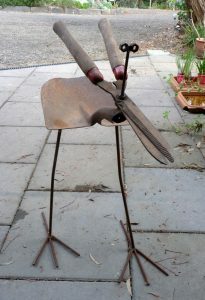 I’ve thought of digging some out and adding fresh well-rotted compost and also planting green manure from time to time. Any thoughts Guy? Soil is effectively a mixture of crushed rock and compost. It is the compost component which is shrinking over time, as the organic matter is broken down into carbon dioxide and water. Most people would, I think, simply top the bed up each year with more compost, to replace that which has broken down. 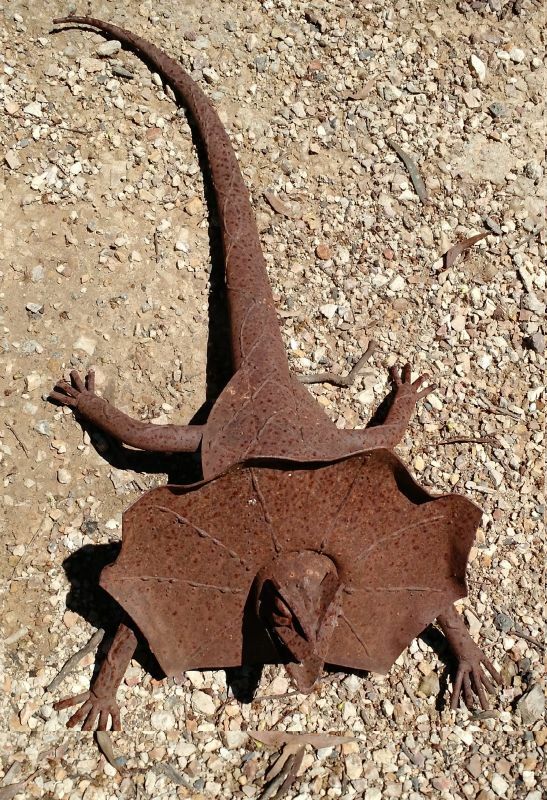 If this is too expensive for you, you could also include some soil, as this will shrink less.